Description: The Cotton Belt features material typically used in Crochet designs. I encourage you to try any form of cotton material for this belt. 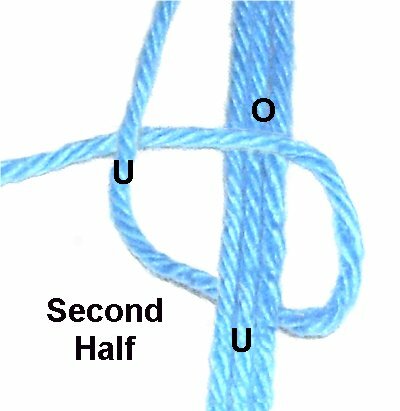 The primary decorative knot is called the Double Buttonhole Stitch, which is a vintage technique. It's simply a series of Vertical Larks Head knots. Two sennits are combined to make narrow loops which are linked. This Macrame belt looks best if you use two colors. 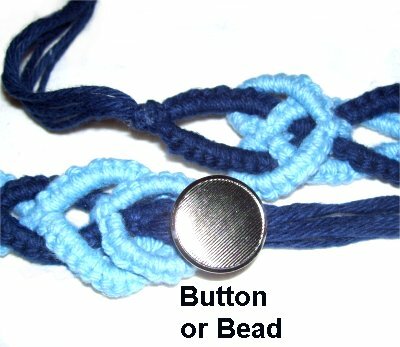 You can make a button clasp, which is described below, or you can simply tie the ends together so the belt has a fringe. 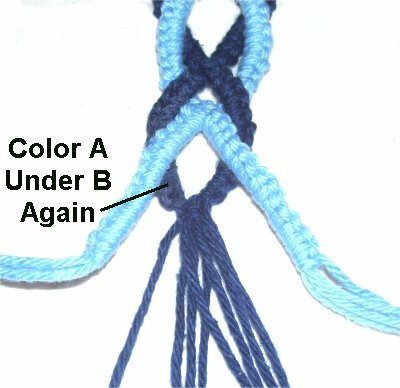 This Macrame project is suitable for beginners who have some experience with the knots used in the design. I rated it moderate, since you are using fine cords, which are harder to control. Be sure to use a project board and pins. Use the chart below to determine the amount of material needed for your Cotton Belt. You need to cut the cords of both colors to the sizes in the chart. 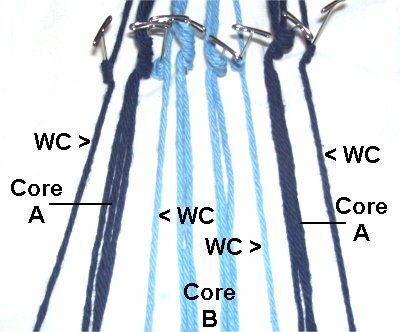 Should you decide to make a fringe instead of a clasp, cut the cords for the core to 4 yards long. The key to handling the long working cords used in this Cotton Belt is to wrap them up in small bundles. Start about 12 inches below the level where the cord is attached to the board. Wrap the cord around your hand several times, until you have about 10 inches left. 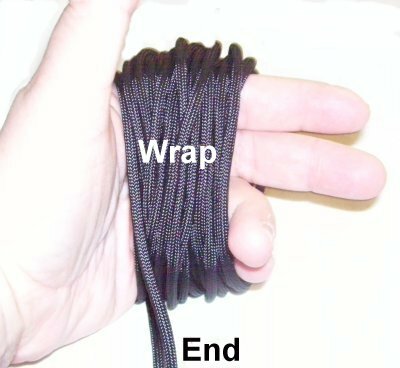 Slide the bundle off your hand carefully, and wrap the end around the bundle several times. Pass the end of the cord under one of the coils, preferably the last one. As you work, you should be able to pull from the middle of the bundle. Start the first half of the Cotton belt by cutting the cords to the lengths in the chart above. 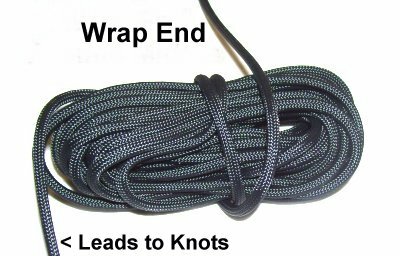 Tie Overhand knots at the tips of each cord. Step 1: Find the center of each cord, and place it on your board vertically as shown below. The best method is to wrap each cord around a pin several times. You can tuck the cords under the board to hold them steady, or use tape. Color A is dark blue, and Color B is light blue in this design. The long working cords are used to tie all the knots onto the shorter cords, which are called the core. 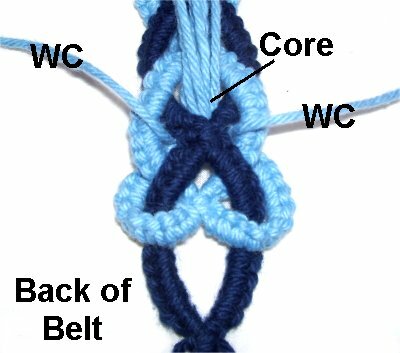 Each sennit is tied with one working cord and three cords for the core (total of 4). Step 2: Each sennit for the Double Buttonhole Stitch is created with a series of Vertical Larks Head knots. They are tied in two parts. 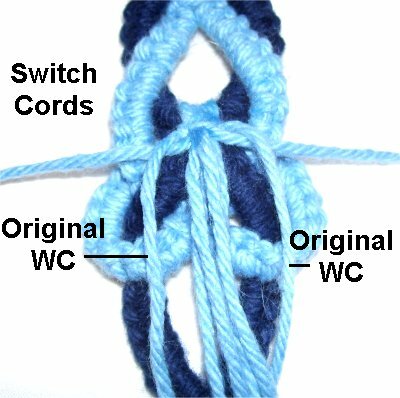 The images below show only the left facing knot, tied with the left working cord. Step A: For the first half of the vertical Larks Head, pass the working cord over and then under the core. Rotate counter-clockwise. Bring it over the working cord as you pull it back to the left. 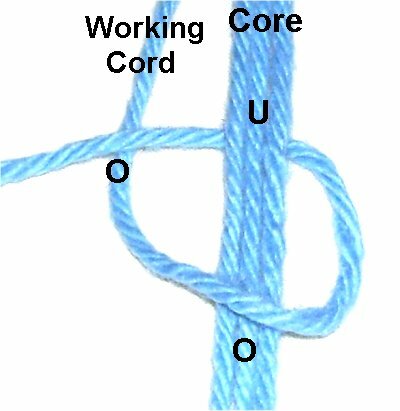 Step B: To tie the second half, direct the working cord under and over the core. Pass it under the working cord, as you bring it to the left. NOTE: When using the working cords on the right, the over - under process is the same, but you rotate clockwise. Step 3: Tie 2 Double Buttonhole sennits for each color. Color A should consist of 10 knots. 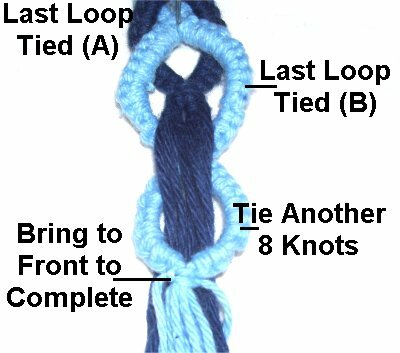 Color B needs to have 13 knots. Bring the right and left Color A sennits together, passing under Color B. 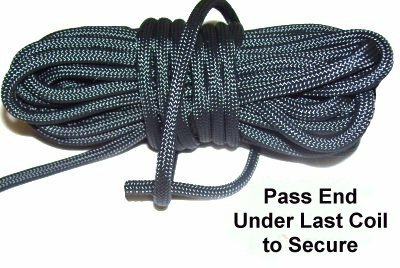 Tie a tight Square Knot with the two working cords, around all 6 short cords (core). Step 4: Bring the Color B sennits together, passing them under the Color A cords. Tie the Square knot with the two working cords, around all 6 short cords. Design Tip: The Color B sennits need more knots, so they are longer. 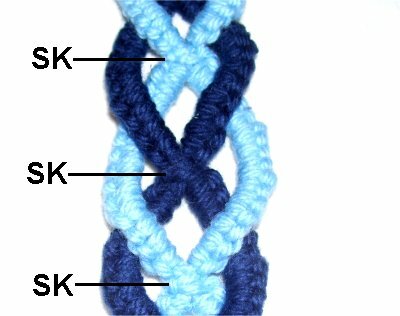 So when you tie the Square knot to close it, the know will rest below the SK from the other color. Once they are resting under the opposite color, tie the Square Knots to complete the designs. This is a closer view of the placement for the Square knots. Notice that each one is near the center of the oval Buttonhole designs. 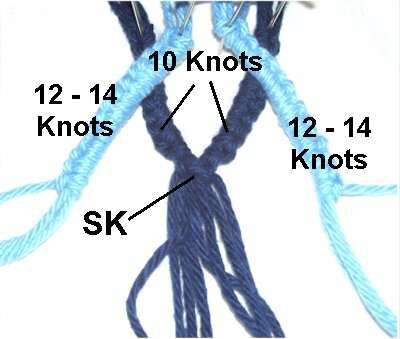 You may need to tie more knots periodically, so the SK line up properly. Step 5, continued: Repeat steps 3 and 4 over and over, until the first half of the Cotton Belt is 1/2 the size you need. So if you are making a 40-inch belt, stop at 20 inches. Each Buttonhole design should consist of 10 - 13 knots, so the design looks like the image above. The last Buttonhole design you tie should be Color B (so these instructions make sense). You can make adjustments to the size in the second half if necessary. Step 6: Go back to the center and remove the pins. Turn the entire board around if you can, otherwise just turn the belt. Make sure you do not flip the belt upside down. Turning the whole board around prevents this from happening. You should still be working on the front of the Cotton Belt, with the ends heading towards you, and the first half of the belt heading away from you. 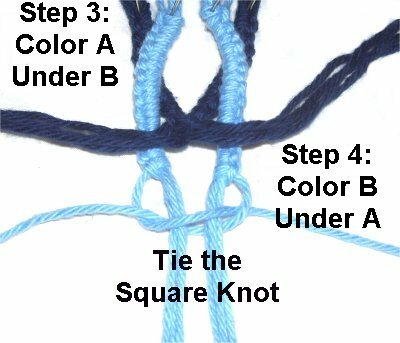 Complete the Buttonhole design of Color B first, by tying the Square knot. Make sure it's resting over the Color A sennits. 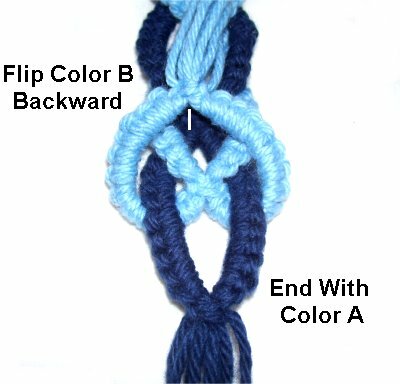 Bring the Color A sennits over the Color B cords, and tie the Square knot. Design Tip: In order for the Cotton Belt design to work out properly, you will bring the sennits together on top of (over) the opposite color. For the first half, you positioned them under the other color. Step 7: You will need to flip the Color A design out of the way, so you have access to the Color B cords. 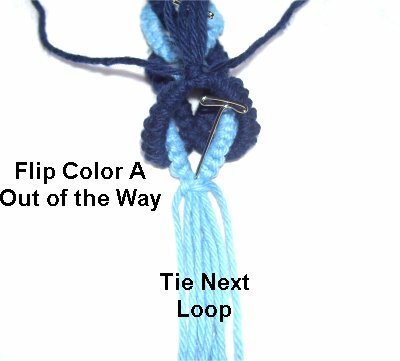 Just below the SK, tie the two sennits for the next Buttonhole design (Color B). Design Tip: For the second half of the Cotton Belt, I found it easier to tie the two sennits for one color, bring them to the front, and tie the SK. I then flipped the design out of the way, and did the same thing for the other color. Step 8: Continue tying Buttonhole designs, alternating the two colors. Stop when the Cotton Belt is the size you want, ending with Color A if you can. 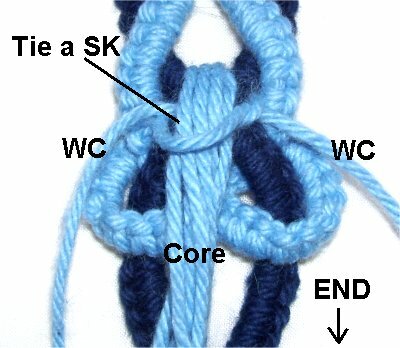 Remember to bring the sennits over in front of the opposite color before tying the SK. Step 9: The following Finishing method is only one option for completing the Cotton Belt. Another way to finish is to apply glue to the SK tied in the last Buttonhole design at each end. You can then use the ends together in a group, tying them together to secure the belt. This is the best way to form a fringe. Adding beads to decorate the fringe looks nice, too. Step A: At the end of the Cotton Belt (second half), fold the last Color B design backward, away from you. 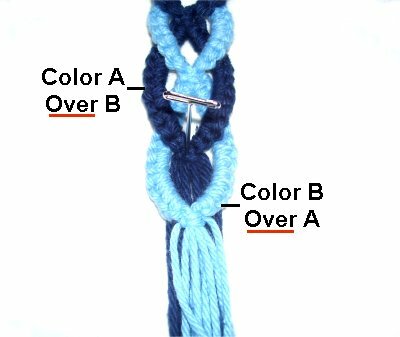 The Buttonhole design for Color A is used as part of the clasp. Step B: Mentally label the Color A designs 1 and 2, starting with the last one tied at the end. Move the 6 Color B cords for the core over the SK of design 2, and through the space in the center. 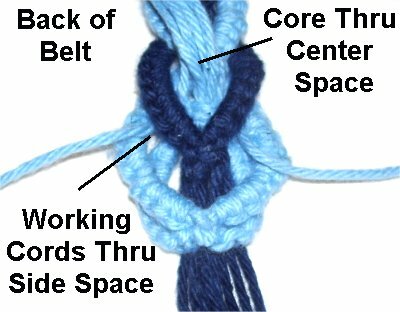 Move the two working cords into the spaces on either side of the Square knot for Color A.
Flip the Cotton Belt to work in the back of it, where you can see the placement of the ends around the Square knot. Step C: Fold the ends towards you (forward). Use the two working cords on the sides to tie a tight Square Knot around the 6 cords for the core. 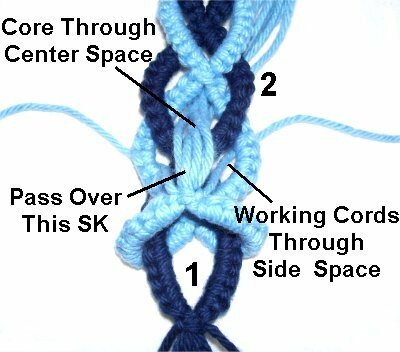 Tie the first half of the knot, apply glue, and then tie the second half. Step D: Switch the working cords with two from the core. Tie another Square knot, also applying glue. Add a little more glue under the knot. When the glue is dry, it's safe to cut off the ends close to the knot. 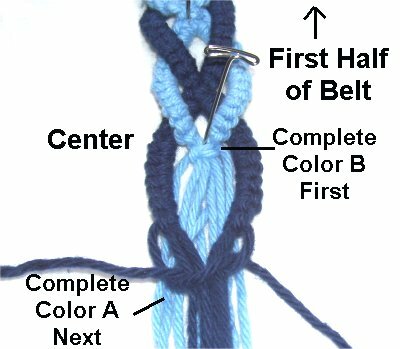 Step E: Go to the opposite end of the Cotton Belt (first half) and make sure the last Buttonhole Loop is color B (light blue). Tie another Buttonhole design with color B, tying a total of 8 knots. Make sure you bring the sennits to the front before tying the SK. 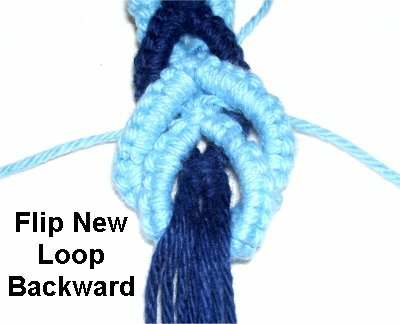 Step F: Flip the new loop backwards, so it nestles inside the closest Buttonhole design (same color). The ends are passed through spaces in the front, just as you did on the other end -- see image below. This image shows the back of the Cotton Belt. The 6 cords for the core are resting in the center space of the Color A design. The working cords should be resting on each side. Repeat Step C - Tying the SK to secure the cords. When you have finished the Cotton belt as described above, you will need to make a clasp. A shank button is required, and it must have an opening large enough for 8 cords to pass through. The button will pass through the last Buttonhole design at the opposite end. Design Tip: I trim the ends so they are even and then apply tape around the entire group, compressing them. It's easier to pull them all through the opening in the button. After you slide the 8 cords through the button, separate the cords into two groups of 4. 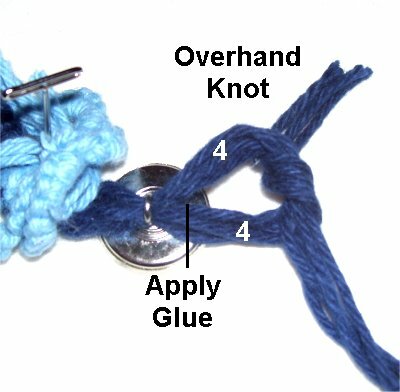 Tie an Overhand knot, applying glue so that it will be on the inside when the knot is tightened. When the glue is dry, cut off the excess material. At the other end of the Cotton Belt, you can add a bead if you wish. 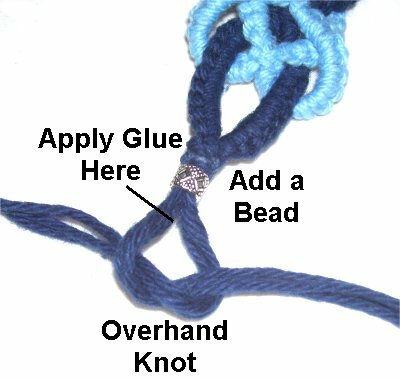 Apply glue next to the bead, and tie an Overhand knot just like you did in the previous step. When the glue is dry, cut off the extra material. Have any comments about the Cotton Belt? Contact Me.